Mark Wright competing at Camp Pendleton. Photo: James Wright. Triathlon attracts many people looking for motivation to get in shape. Nothing inspires like a deadline, so many first-timers will sign up for an event a few months away, and then throw themselves headlong into an overly intensive workout schedule. Most training programs and advice columns aimed at novices operate under the assumption that beginners are within a normal BMI range and can quickly adapt to the new exercise regimen (Day 1: Run for 10 minutes? I could barely run for 10 seconds my first time out!). Unfortunately, many budding, heavyset triathletes try to do too much, too soon, and frequently find themselves burned out or injured. They are often inspired by contestants on extreme weight-loss shows that are pushed far beyond their perceived limits and think “If they can do it, so can I!” While these shows can certainly be motivating, many viewers may not realize that a full-time staff of medical experts is supervising the contestants’ every move, a luxury no real-life beginner would ever have. The key is to train wisely and sustainably. Do it without overdoing it. Super-Athenas and Ultra-Clydes with an excess amount weight to lose should focus on exercises that are easier on the joints and begin monitoring their diet and nutrition. They should spend the bulk of their time in the pool and on the bike. Running with an excess amount of weight puts incredible amounts of strain on the joints, so start slowly. Start with walks, and slowly add in short jogs. You don’t have to be able to run an entire 5k to complete a sprint triathlon. There are no rules against walking, and you can rest assured knowing you won’t be the only one walking from time to time during the run portion (there will be plenty of walkers – trust me). If possible, hire a USAT certified coach to guide you in the unique training that triathlon demands. Another common pitfall is trying to increase distances too soon. Many complete their first sprint event and think “That wasn’t so bad!” and decide the next step is an Ironman. Spend your first season doing sprints. If that goes well, work your way slowly to Olympic-distances the next year. There’s no rush to do an Ironman, and you can still consider yourself a triathlete even if you never do a full-distance event; many triathletes never do, just as many dedicated daily runners never feel the need to complete a marathon. Tragically, the internet is littered with the blogs of heavyset beginner triathletes whose early entries are full of optimism and excitement about their new-found love of the sport and their determination to complete an Ironman, but soon turn to tales of blown knees or slipped discs and ultimately fall silently into the graveyard of abandoned blogspaces. They overdid it, injured themselves, got discouraged, and quit. Don’t let that be you. Remember this mantra: Slow and steady may not win the race, but it will get you to the finish line. Dr. Mark Alan Wright has a PhD in Anthropology and is a professor at Brigham Young University. 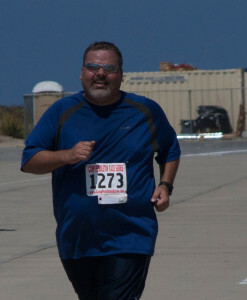 He has trained for and completed nine sprint-level triathlons with no injuries, despite weighing well over 300 lbs.